Some items were pure luck, like the Super-Sketch (Sketch Master) that I don't even intended to get. The Wizard of Id Wizmath and Q*bert Qubes were other two very difficult to obtain. Now my Colecovision cartridges duplicates, most are in not so good state, primary cause of having to order more cartridges. This picture includes the rare Q*bert with silver label. Also the Facemaker and Smurf's Paint and Play Workshop cartridges doesn't work. Also included three Atari cartridges that doesn't work. And here is my very small Atari Collection. My small MSX collection, including the games I've wrote. A recent addition to my Atari collection, plus all the other platform cartridges in my collection. Recent additions to my Sega Master System collection . Only Out Run 3D has the manual, so technically it is the only CIB. Edited by nanochess, Sat Jun 21, 2014 7:43 PM. Looks great. I am trying to accomplish that myself. The boxed super sketch is really cool. I could probably track them down if you are interested. Thanks. I'll take it in account for the future if I become a more serious collector. I've added pictures of my duplicated cartridges and my collection of homebrews. Edited by nanochess, Fri Jun 7, 2013 8:18 AM. Very nice loot you have there! How did you find the Super Sketch? I was talking through Internet with someone about the difficulties I had when getting the last two cartridges (Q*Bert Qubes and Wizmath) for my collection and unexpectedly this person said "Would you like to get a Super Sketch? ", I didn't think twice, I got it! Added MSX cartridges, Too few because them are pretty expensive to get from Europe. Interesting label on Pigs in Space.. where did you get it? And is the publisher Atari? It was the only one in two big bags of cartridges I checked. It looks like Taiwanese, also has missing the top label. Thanks for showing your collection updated. Would love to own the Sword Quest series. The concept is mind blowing!! Edited by retroillucid, Thu Jun 13, 2013 6:19 PM. I'm pretty surprised (and proud) of having it . That's funny, I'm also a fan of SwordQuest. The games themselves are admittedly terrible, but there's something weirdly magical and magnetic about them, which I can't really explain. Maybe it's the in-game mechanic of discovering items in secret rooms, picking them up and dropping them off in other rooms to get some kind of reward. A crude mechanic, but unique in its own way. Today, I'm in the mood to let you all in on a little secret: I've been thinking of remaking the SwordQuest series on the ColecoVision for several years. It's like a little holy grail for me, much like doing Zelda on ColecoVision is a holy grail of J-F. I envision these SwordQuest remakes as isometric games which draw more inspiration from the SwordQuest comics than the actual Atari games. Below are some VERY old mockups I did, according to an old, obsolete vision I once had of the remakes. If I were to do the SwordQuest remakes today, they would be very different. 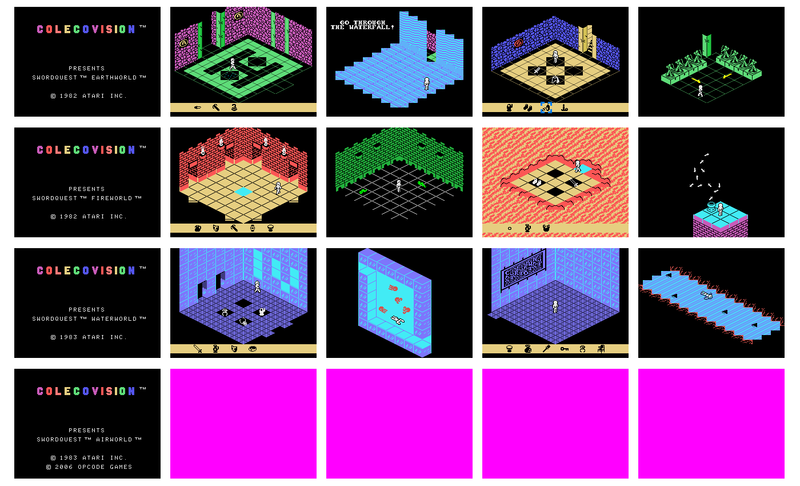 They would still use isometric graphics, but the rooms would have a LOT more content, and the end result woud look something like a simplified version of the NES game "Solstice". I may never get around to actually doing these proposed SwordQuest remakes on ColecoVision, but the desire to do them is definately there. Although I'm not really a fan of SwordQuest games, I got this complete series just by accident . Edited by nanochess, Tue Jun 18, 2013 1:31 PM.